As the Architects and Inteior Designers for the new EaglePicher expansion at Crossroads, we would like to congratulate EP on getting into their new facility! EaglePicher Technologies celebrated the grand opening Friday of its new Lithium Ion Center of Excellence, 8230 E. 23rd St. in the Crossroads Center Business and Distribution Park. 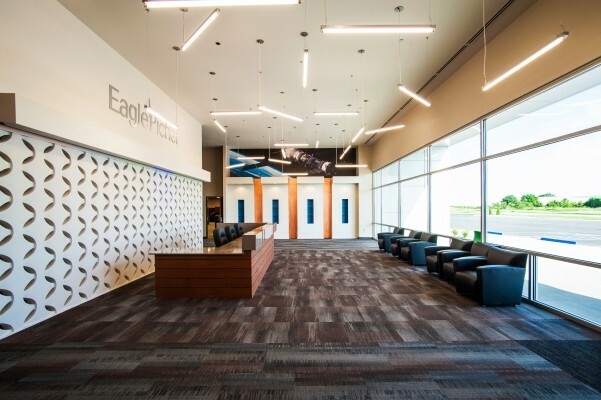 "I think the people of EaglePicher are extremely proud to be showing you what is truly a world-class facility here in Joplin, Missouri," said Gordon Walker, president of the company. "This is absolutely a tremendous asset for EaglePicher, for the city of Joplin and actually for the United States in general." EaglePicher has been a leading producer of batteries for more than 100 years for the defense, aerospace, medical, commercial, grid energy storage, and oil and gas industries. Batteries developed by EaglePicher and/or its subsidiaries power the International Space Station and Hubble Telescope, and they have launched the Juno spacecraft into orbit around Jupiter, helped set the Curiosity on Mars in 2012 and powered the ill-fated Apollo 13 mission of 1970 in its return to Earth. That work and more will continue in the new center, as battery systems could be built for the aircraft market, the U.S. military and the field of medicine, Walker said. "Today in this facility, we build batteries for space; we build batteries that are going into satellite programs," he said. "We are building batteries for medical devices that are implanted in people's bodies for cardiac rhythm management. We are today making devices that go into neurostimulation implants, things that literally help people manage pain over long periods of time. "There is a tremendous future ahead of this facility, and when we look forward to the things that this building is going to do and going to enable us to do, it is absolutely tremendous," he said. The ceremony included a ribbon cutting and remarks from U.S. Rep. Billy Long, who said it's because of companies such as EaglePicher that he often brags in the House Energy and Commerce Committee in Washington, D.C., that he represents "the best district" in the country. "The quality of people, the work ethic in this area is off the charts, and when you have a good strong company like EaglePicher, a lot of it is because of the people that work for that company," he said. The journey to get to Friday's grand opening was a long one, said Ron Nowlin, vice president and general manager of the company. EaglePicher submitted a competitive bid back in fall 2011 to the Defense Production Act Title III Program to develop a new technology for high-energy lithium ion batteries. The company was awarded the work in a $22 million contract from the U.S. Department of Defense in March 2014, and EaglePicher broke ground on its new center in March 2015. While the fully automated production area of the 100,000-square-foot building is slated to be qualified and running by September 2017, the center's office space — which now houses the company's executive department — opened about two months ago, Nowlin said. Within five years, officials expect to employ about 170 people at the new building, Nowlin said. EaglePicher's location at 1216 W. C St. will continue its production of thermal, silver zinc and non-rechargeable lithium batteries, he said. Rob O'Brian, president of the Joplin Area Chamber of Commerce, said the Joplin Business and Industrial Development Corp. was an original partner in and supporter of the project. "We appreciate the investment that EaglePicher has made and their view of the future and what they can bring, not just to Joplin and the Joplin region, but also to the nation," he said. Long was joined at the event by state Sen. Ron Richard, state Rep. Bill White and representatives from the offices of U.S. Sens. Claire McCaskill and Roy Blunt. Also present were several of EaglePicher's customers and local partners, including Marsi Archer, department chair of chemical and physical sciences at Missouri Southern State University. MSSU works with EaglePicher and three other Missouri universities to form the Missouri Center for Advanced Power Systems, which is designed to develop educational curriculum and facilities that enhance, promote and develop the education level and job opportunities relating to advanced power systems. EaglePicher plays a "very large role" in that partnership, Archer said. "They have been very involved with MOCAP from the beginning ... to really get this project off the ground," she said. During his morning in Joplin, Long also toured the Advanced Training and Technology Center, an adult education center focused on skilled labor fields. The center, 420 S. Grand Ave., previously housed Franklin Technology Center after the 2011 tornado. It is being renovated and remodeled through a partnership that includes the city of Joplin, the Joplin Area Chamber of Commerce Foundation, the Workforce Investment Board of Southwest Missouri and Crowder College in Neosho. "This is really a great repurpose of the building here," Long said. The Workforce Investment Board already has begun to move into the building, while Crowder is slated to begin offering classes in advanced manufacturing, welding, information technology and community health in 2017, O'Brian said. The lithium ion battery offers "very high energy" compared to other rechargeable systems, according to Ron Nowlin, vice president and general manager of EaglePicher Technologies. It also has a good cycle life, which means that it has the ability to charge and recharge many times, he said.